It’s that time of year where the temperatures have plunged to the sub-zero range and taken us hostage indoors. There is not a lot going on around the farm and not a lot to write about either. I have wandered outside a few times with my camera looking for something interesting to take photos of, only to feel disappointed by the drab colors and lack of life everywhere I look. It exists in such contrast to spring and summer when this place is bursting with life and the possibilities seem endless. 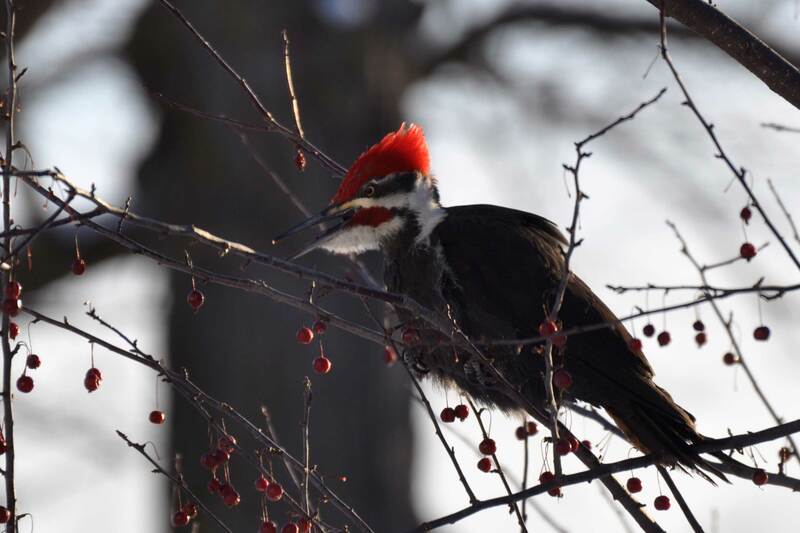 Yesterday, I was standing at the kitchen sink after arriving home from driving my daughter to orchestra when I glanced up and noticed this pileated woodpecker out in the crabapple tree. Ah! A sign of life! I fumbled through my camera bag to get my new telephoto lens to snap some close-up pictures. By the time I got the telephoto lens on the camera, I only had time for a few shots before he flew away back into the woods. I am disappointed that the pictures did not turn out very sharp. It was a good reminder to slow down, get the settings and focus right, and not rushing just to snap a picture. Even though the pictures did not turn out that great, I was nonetheless thrilled to see this unique bird up close. They really are large birds, about the same size as a crow. I think they have a prehistoric look to them, maybe a bit like a pterodactyl. And while I have trudged around outdoors recently in search of something interesting to photograph, it turns out that the remaining fruit on the crabapple tree right outside my kitchen window is providing some of the best winter subjects. Even better is that in the dead of winter, there are signs of life around here. You just have to be paying attention. I have been stuck in that same rut… Everything is so drab and white. It just doesn’t inspire much photography! So happy that we are out of the deep freeze this week, though! Green is coming!